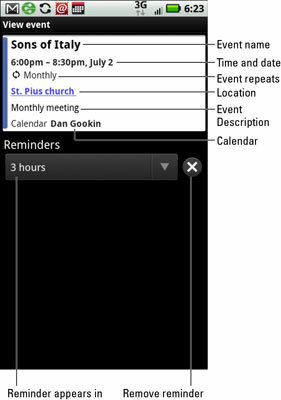 You can use your Droid X as your calendar and date keeper. Your Droid can easily serve as a reminder of obligations due or delights to come. It all happens thanks to Google Calendar and the Calendar app on your phone. You can use Google Calendar to keep track of dates or meetings, or whatever else occupies your time. You can also use your phone to do the same thing, thanks to the Calendar app. Touch the Launcher button at the bottom of the Home screen. Choose the app named Calendar. 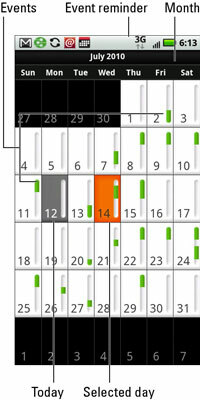 The first screen you see is most likely the monthly calendar view. The calendar looks like a typical monthly calendar, with the month and year at the top. Scheduled appointments appear as green highlights on various days. To view your appointments by week, press the Menu soft button and choose Week. You can also choose the Day command to see your daily schedule. Return to the Month view by pressing the Menu soft button and choosing the Month command. To see the current day highlighted or displayed, press the Menu soft button and choose the Today command. To see more detail about an event, touch it. When you’re using Month view, touch the date with the event on it, and then choose the event from Day view. Press the Menu soft button and choose the Agenda command. 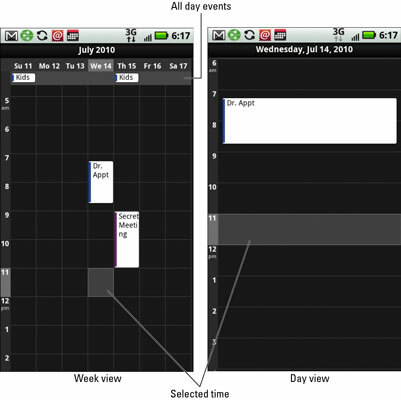 Rather than list a traditional calendar, the Agenda screen shows only those dates with events and the events themselves. It’s sort of a list. Like with the events in the non-Agenda views, simply touch an event to see more details. If you touch the event on the calendar too long — if you do a long-press — choose the item View Event from the menu that appears.